Are some of your company’s work zone operations done at night? While nighttime operations do have some benefits, members of your work crew may be less safe in them due to decreased visibility. During these low-light operations your team should be wearing Illumagear’s Halo light, which will not only increase their safety but also their productivity. The Washington State Department of Transportation calls nighttime highway construction operations, “inherently more dangerous due to the reduced visibility and the much higher percentage of impaired drivers.” While this may just sound like rhetoric, this increased state of danger can be backed up by fact. While still a vast majority of highway construction is done during the day time hours, 35% of all work zone crashes in 2014 happened at night, according to the Federal Highway Administration (FHWA). Additionally, according to the Laborers’ Health & Safety Fund of North America, 22% of all injuries to highway construction workers in 2013 happened between the hours of 4 p.m. and 8 a.m..
Because of the correlation between low visibility operations and an increase in work zone crashes, ensuring that the workers in the work zone are properly illuminated is essential to their safety. What is the Illumagear Halo light? Will the Illumagear Halo light work with my hardhat? Because the Illumagear Halo light simply attaches to a hardhat, instead of coming fitted to one, it is often asked whether or not the light will fit on the specific brand of hardhat used by your company. Simply put, the Halo light has been confirmed to fit many of the most popular hardhats used in the industry today. For a complete listing of all the confirmed to be compatible hardhats, read more here. How visible will it make the workers in the zone? Ultimately, the goal of wearing the Illumagear Halo light is to make workers in work zones as visible as possible to increase their safety in nighttime operations. According to Illumagear, the Halo light provides over ¼ mile of visibility. This gives travelers driving through the zone more than enough time to react to seeing the workers by slowing down their vehicle. With each worker having their own personal lighting system, each member of the crew can be individually identified by drivers and made visible no matter where they are in the zone. This mode provides maximum brightness for the full 360º degrees of the light. While this mode is versatile and can be used in any number of situations, it will only allow for 5.5 hours of battery run time. When using this mode, the light pulses around the helmet with one section of maximum brightness rotating around the helmet. This is ideal for flagging operations, where it is essential for the wearer of the helmet to be seen. Task mode is most similar to a traditional headlamp. It fully illuminates the lights in the front of the helmet while keeping the back lights dimly lit. This mode should be use if brightening the area in front of you is necessary, as is the case when you are looking to complete one of the job’s many tasks. Last, but not least, is the dim mode. Ideal when working in close proximity with other members of your work crew, dim mode provides some illumination while also not blinding other members of your team. If you are only using this mode, the battery will last over 34 hours! As in many operations though, you will need to switch between the modes depending on what the job entails. When switching between the four modes, the Halo light has an average battery duration of 15 hours. In relation to the question about how long the battery’s life is, the next logical question is how long it takes to recharge the battery. For the newest edition sets, powered by a Lithium-Ion battery, Illumagear states that it will take 3 hours to charge the battery up to 80% and up to 5 hours to charge fully drained batteries. In terms of charging time, these numbers are calculated while using Halo’s 2-battery 1865- Lithium-Ion charger. The Halo 2-battery 1860- Lithium-Ion charger allows you to charge 2 batteries at once, allowing you to quickly replace drained batteries in two separate sets with fully-charged ones. This limits down-time in your operations, leading to greater productivity. Is the Halo light blinding to others close proximity? As previously discussed, the Halo light’s Dim Mode is ideal for situations in which multiple individuals need to be within close quarters. Compared to Halo Mode, having the light in Dim Mode significantly reduces the lumens produced by the headlight and, in turn, reduces the likelihood of momentarily blinding another individual. By the nature of how it is built, the Illumagear Halo light provides a full 360° of lighting. This allows other individual’s eyes to slowly adjust to the light while approaching another set. This is a clear advantage over headlamps, which only illuminate one area and, thus, are a shock to other worker’s eyes. Perhaps the most important thing when introducing any new piece of safety equipment to a work zone is ensuring that it is durable enough to be used. The Halo light can withstand a fall from 25 feet in the air and will still work after being submerged in up to 1 meter deep of water for 30 minutes. Still don’t believe that the light is durable enough to withstand anything you throw at it? Watch the set be put up to the test against being driven over by a Jeep and dropped from a scissor lift approximately 25 feet in the air. In both cases, the Illumagear Halo light not only survived the damage, but continued to work perfectly afterwards. Simply put, the Halo light is more than durable enough to be used in a highway work zone without the fear of it being damaged in the rough environment. The LED lights used in the system also have a life of 36,000 hours, meaning that this system is one that you will most likely not need to replace for a significant amount of time. Can the Halo light work in any weather environment? In addition to being durable, the Illumagear Halo light can be used in virtually any weather conditions your operations would be in. The Halo light can be used in rain, snow, or shine and is durable enough to withstand any challenge you may throw at it. The light is designed to operate effectively in temperatures between 32°F all the way up to 122°F. While you could use the Halo light outside of this range, Illumagear warns that the light’s battery life may be shortened. Why should I use the Illumagear Halo light instead of just a headlamp? The Illumagear Halo light does so much more than a traditional headlamp. There are several areas where a standard headlamp fails in comparison to the Halo light including brightness. According to Illumagear, a traditional headlamp produces about 50-75 lumens. In comparison, the Halo light can produce up to 202 lumens! Additionally, headlamps do not help create a safe work environment for the workers. Headlamps are created with the purpose of brightening an individual area with the goal of being a spot task light. The Illumagear Halo light not only does this, but it is also an extremely effective safety tool. It allows the wearer to be seen by oncoming traffic in nighttime operations, an essential step to creating a safer work zone. When compared to other forms of lighting currently used in work zones, the Illumagear Halo light reigns supreme as well. Area lighting, which brightly illuminates the area it is surrounding, fails in comparison to the Halo light, as it is not easily portable and often casts shadows on the workers. Another frequently used measure to make workers more visible during nighttime operations in retroreflective gear, mainly used as vests. While this does make the wearer visible when light is reflected off of it, it also pails in comparison to the Illumagear Halo light as it requires a secondary light source to be effective. Illumagear does say though, that when used in conjunction with its Halo light, the reflective gear becomes more useful as the user always is near a light source. Nighttime highway work zones are significantly more dangerous than their daytime counterparts. The lack of light leads to a lack of visibility, which leads to a sharp increase in dangerous driving and worker’s injuries. Illumagear’s Halo light is a simple, light weight solution which allows for your workers to be seen in nighttime operations, leading to a much safer work environment. 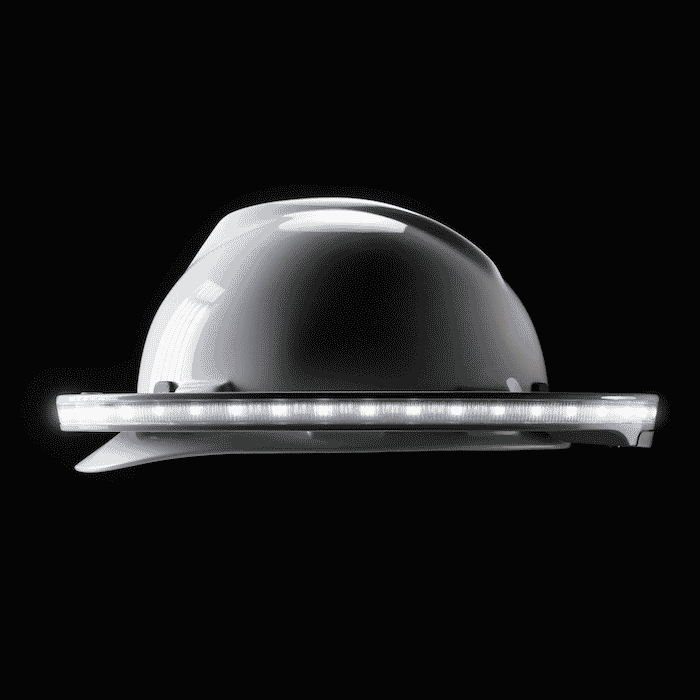 Unlike traditional headlamps, which offer no safety benefits to the wearer, the Halo light not only provides the wearer with a task light but it also allows them to be seen by oncoming traffic, increasing visibility and safety. Want to see the Halo light in action? Watch the video below to see all of its capabilities! If you are interested, click here to have a member of Royal team answer any questions you may have!